I’ve shared a lot about my firm’s progress. That’s what my blog is built for. But I don’t think I’ve shared enough. 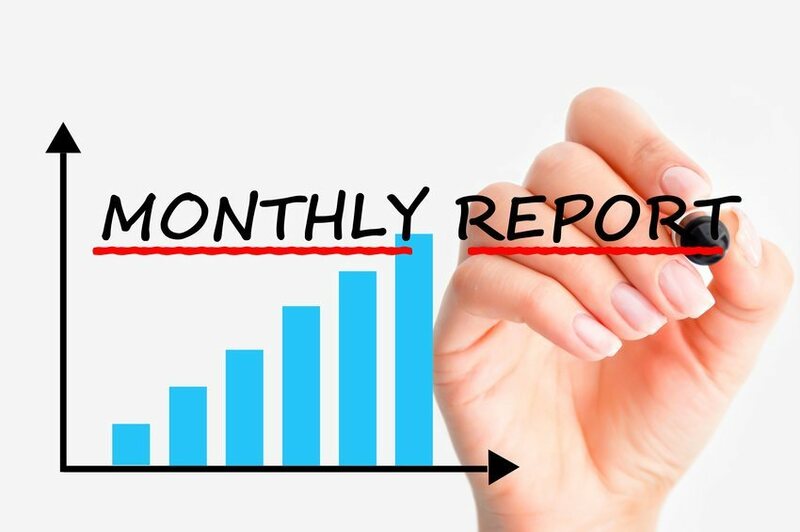 After reading this post about sharing from Ken Grady, I’ve decided to act on an idea I’ve carried for a while: monthly income reports. Many online personalities do this. They’re radically transparent. The exercise inspires others, holds the author accountable, and passes on valuable lessons learned. So, today, let me tell you about my progress in the month of March 2018. My first full month back in law practice. Obviously, the biggest change in March 2018 was that I started taking cases again. I’d shut everything down in Rockport and had no intention of picking up the practice again. But, after hurricane Harvey I’d been asked to help out there, and after last year’s conference I had the time to give it a shot. Starting (or restarting) a law firm involves a lot of work, especially when you’re practicing virtually. There are inherent disadvantages to practicing from afar. I can’t take court-appointed cases right now, so options for quick cashflow are limited. I had to get clients coming in. My buddy John Grant challenged me to sell $10,000 worth of business in March, and I couldn’t do that without fixing my web presence. The main source of online traffic for me is Google Places results. Those are the map options you get when you search for something on Google, the ones at the top. So I worked this month to claim the My Business listing and to build it up. I made some progress creating systems, but there’s so much more to do there. I hired someone to help me develop processes, and the time I spent with John certainly helped. I know what needs to be done, and am balancing my desire to have it all done right now with the realities of time and distraction. Remember, we all overestimate what we can do in a day, but underestimate what we can do in a year. My goal this month was to get to the next step. I think I have. There’s a firm bringing in and serving clients, and that’s more than existed in February 2018. Let me tell you how I’ve done it. As you can see, I’m nowhere to be found. Searchers actually have to flip to the next page to find my listing. No one does that. 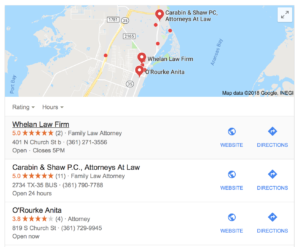 The two attorneys that show up first are no longer practicing, and the third is a personal injury firm in Corpus Christi. Meaning, people who land on these listings call someone else that can’t help them. I decided not to fret too much about this. I don’t want every kind of client in Rockport. I want people with family and probate issues. A general search could really be for anything, so maybe not being at the top is a win. Or maybe I’m spinning that to make myself feel better. In this example, I pop up right at the top. This has to do with the category labels you pick on your Google My Business page. So definitely take a look and make sure your category listings are correct. You can see again the personal injury firm, followed by another family law attorney who is no longer practicing. But my name and number come up at the top. What does that mean for me in terms of contacts? This is the number of people who found my listing in Google Places. 220. Most of them found me by searching some term other than my firm name. 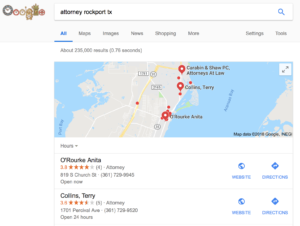 So these are people who search things like “attorney Rockport tx” and page through to click on my Places listing. The “direct” search results are for people who search my name specifically. And what do people do when they find me in the search results? Some call, some go to my website, and most move on with life. As you can see, only 8 people called me directly from the Places listing, and only 8 clicked through to my website. I need to get better results from Google Places than that. My other online efforts are too new to have results at this point. I’m creating a content machine and expect to make progress on the organic search results in Google, but that’ll take time. You can get quick wins from Google My Business, so make sure you claim that listing and add information to it. I’ll give you limited information on my income breakdown at this point. I feel like, as long as I keep things generalized, there are no ethical implications. I’m willing to risk that. In terms of big picture, I’ll tell you that I did not quite hit my $10,000 sold goal for the month of March. I got really close, but couldn’t close that one additional client that would have put me over the top. Frankly, I didn’t expect to do as well as I did, so I’m still counting this as a win. I’ll break this down in terms of receivables and revenues. My amounts “sold” are the new cases I’ve added on and the total value of that case. Since I’m using almost entirely flat fees, these are easy to calculate. But the revenue number will show how much I actually collected. The revenue number is about what I expected. With my wife working now, that’s enough for us to survive on. This is still a little fuzzy, and I need to get better at tracking these things. Future reports will be more clear. In general, I’m trying to live by the percentages laid out in Profit First. That means 50% of revenue to me as the owner, 5% to profit, 15% to taxes, and 30% to expenses. But I totally failed at this math. I took out too much for myself. Between a move and my wife just starting her job, we weren’t able to handle the money the way I wanted. I know there’s enough in there for the expenses I incurred last month, and for the tax account, but I don’t want to get into bad habits. Next month I’ll share more detailed expenses with you. So far, they aren’t much. I need to find a better office solution in Rockport, and to get contract employees ratcheted up. So those costs will rise fast, and I need to get more clients. I’ve learned a lot of lessons, mainly that I need to do a better job of running this thing like a business. It’s easy to decide you’re “too busy.” I’m a stay-at-home-dad right now, trying to build this law firm while also building Lawyer Forward. The kids are homeschooled and life is certainly crazy. But I have time for the business I need this to become. It doesn’t have to be a million dollar business overnight. It can be what it is this year, and we can grow gradually. But I can’t treat it like a hobby anymore. For April, I plan to get more concrete systems in place, particularly for bringing in new clients. I’m only using organic marketing this quarter, and will look into paid traffic later in the year. I hope this look behind the curtain was helpful, and intend to share more in the future. Whatever your goals for your practice, I know you can accomplish them if you put in the right work every day. This entry was posted in Guest Bloggers, Solo & Small Firm Practice and tagged Mike Whelan. Bookmark the permalink. Mike Whelan, Jr. is host of the Lawyer Forward conference in Austin. He recently reopened a practice in Rockport, Texas and writes about it at lawyerforward.com/relaunch.